With the new year approaching, millions of Americans will make New Year’s resolutions; last year, 44 percent. Unfortunately, only 8 percent will actually keep their resolutions. But we think the students who follow our blog will have better results, so we want to encourage you to make a New Year’s resolution that will improve your academic career. 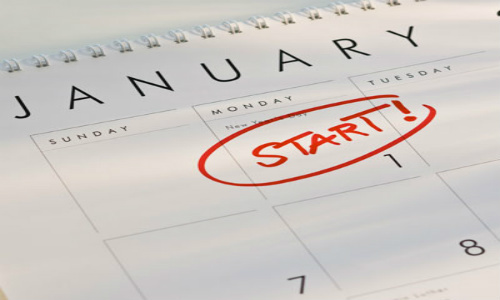 What makes a good New Year’s resolution? First of all, keep it simple. You’re less likely to keep up with a convoluted plan or juggle eight different resolutions. Choose a single, tangible, measurable goal—if you say something like “I’m going to be a better student this year,” it is just too ambiguous to keep up with. Finally, tell your friends and family so they can help you stick to it. In fact, you can even share your resolution with us on Twitter or Facebook! We know students interested in the Foundation are typically students with excellent study habits. But everyone can always improve, and perhaps how you study is as important as how much. Setting a regular study schedule—specific times or a minimum number of hours per week—whether you have work or not, can really prepare you for college or help you succeed if you’re already enrolled. So college is pretty demanding; how is a good student supposed to find time to work out or keep track of their diet? It turns out exercising will actually help you study more efficiently and effectively, likely reducing the amount of time you need. Harvard Medical School reports regular exercise improves memory and thinking skills, and if you study well in advance of your class or exam, it may even help to exercise simultaneously. Don’t worry about weight or appearance; instead, keep your goals to things like working out three times a week, running a certain number of miles, or eating certain kinds of foods. No matter what you do, volunteering is worthwhile because it will improve your own attitude and can even be an outlet for stress. But it also strengthens your resume for college application or your professional career. Pick one organization you want to support and make a regular commitment (weekly, monthly, etc.) Read our recent blog post about volunteering in your community. Attending college challenges students in many ways, including managing money on their own. Set a realistic, tangible savings goal, or keep a weekly or monthly budget. If you’re in high school now, have you taken an Advanced Placement course yet? Ask your guidance counselor—it may not be too late to add one. Take a test prep course for the SAT if you’re in high school or the GRE if you’re already in college; financial assistance is available for low-income students. Perhaps try an academically-oriented extracurricular activity like debate club or an out-of-school event like a “mathlete” competition.